Religious education can help us grow in faith, at any age. Faith development happens outside of our faith communities, too, especially at home. Parents and caregivers are our children’s primary religious educators, and not only because we give explanations and advice. Every day, we model attitudes toward faith, meaning, and purpose that children will notice and copy. At CVUUS, we support one another to discover and rediscover a seeking, active faith in the context of our family lives. UU Parenting – Pinterest Activities, book lists, traditions, quotes, link for all ages from Michelle Richards. Poppy has a UU Pinterest board as well. Growing Young Justice-Makers Resources and ideas to help parents and religious professionals engage children in living UU values through social justice. Call and Response blog – dialogue and reflection on UU faith development, can subscribe to newsletter, by UUA Faith Development Office. 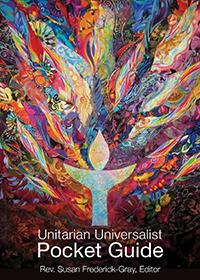 Parents as Spiritual Guides 6-week UUA curriculum for UU parents to support ideas for behaviors and rituals at home. UU Parenting Facebook group Facebook group.